“Garden Spicer” Sean Spicer cutouts are popping up in bushes and hedges nationwide after he hid in a White House hedge to avoid reporters last Tuesday. The Washington Post and other news outlets reported last week that White House Press Secretary Sean Spicer literally hid behind a hedge at the White House to avoid reporters Tuesday night in the wake of Trump firing FBI Director James Comey. 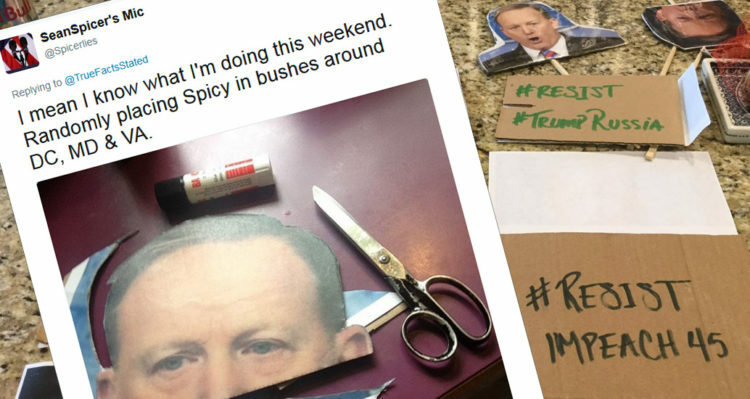 In the wake of his insane maneuver, social media has been exploding with accounts of people placing Spicer cutouts in bushes and hedges from coast to coast. As The Hill reports, an Ontario resident seems to have kicked off the affair by posting photos of Spicer cutouts on her Facebook profile last Wednesday. “Presenting the ‘Garden Spicer.’ Here’s something I made this afternoon. Now you too can have the White House press secretary in — or rather, ‘among’* — the bushes in your yard. And hey, if you’re concerned that when exposed to the outdoors, the image will run ….no worries, that’s exactly what Sean Spicer does, so it’s totally authentic!” she wrote. Meanwhile, The Independent and other news outlets report that Spicer’s job as White House Press Secretary may be in jeopardy over his handling of the James Comey firing. A White House official told CNN Ms Sanders’ performances, which have already garnered praise, would be closely monitored by those in the highest tiers of the administration. Another source said the big question is whether his time on the bench is temporary or permanent. A White House official has now taken issue with the exact details of Mr Spicer’s whereabouts when he retreated to a nearby hedge. As such the initial Washington Post story, a colourful descriptive piece, has been amended to reflect that Mr Spicer was hiding “among” the bushes rather than “in the bushes”. Time will tell whether Spice becomes the next person tossed from the Trump administration, but in the meantime – the laughs are on him!